The scholarship fund was launched in January 2016 and as of December 2017 generous donors have given almost $70,000 toward our goal of $90,000. We are incredibly grateful for the donations that have been made so far in Becky’s memory. The inaugural scholarship was awarded in the fall of 2017 to Brittany Morris for $2,000 based on the funds raised to date. If we successfully reach our goal of $90,000, subsequent awards will be increased to $3,000, raising the scholarship’s impact and significance. Donations of any amount are still being accepted and will go a long way to helping us realize our goal. If you haven't already, please take a moment to checkout the link below and make a contribution. Our goal is to raise $90,000 so that we can award $3000 annually to an individual who shares Becky's vision for the planet and strives for transformative change. With your help we can inspire future leaders to continue Becky's work. 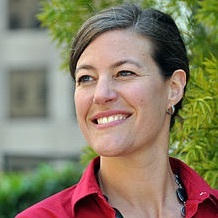 Rebecca Tarbotton, known to friends as Becky, was a profound thinker and leader. She was dedicated to merging environmental and social justice movements towards transformational changes in forest protection, climate change and human rights. A self-proclaimed “pragmatic idealist”, Becky was deeply admired by a whole movement of activists for her boldness and clarity of vision. We don't always know exactly what it is that creates social change. It takes everything from science all the way to faith, and it's that fertile place right in the middle where really exceptional campaigning happens - and that is where I strive to be.